2-Hole Smooth-Face Clip, Strap Clip, Clear, 2-3/4" (70mm), Flex Vinyl Strap 100 Piece/Bag, Large Snaps. Sold in quantities of 100. Priced per 100 units. 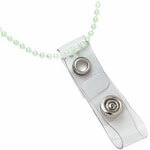 Strap Clips, Chain and Neck Cord, 3-3/8" Clear Flexible Vinyl Neck Chain Strap Adapter. Sold in quantities of 100. Priced per 100 units. 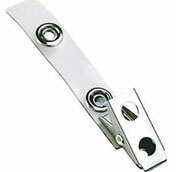 Strap Clips, Strap Clip, Frosted, 2-1/4", (58 mm) Molded Strap, White Plastic 1-Hole Clip Steel Spring. Sold in quantities of 100. Priced per 100 units. 2-Hole Smooth-Face Clip, Reinforced Vinyl Strap Clip (4 1/8"). Sold in quantities of 100. Priced per 100 units. Reinforced Vinyl Strap Clips, Reinforced Vinyl Strap Clip (2 3/4"). Sold in quantities of 100. Priced per 100 units. Holders, Badge Attachment, Magnamini Small Plastic Encased Magnetic Badge Attach. Sold in quantities of 50. Priced per 50 units. Clear Vinyl Strap Clips, Pin-Clip, Strap Clip with Pin/Clip Combo. Quantity of 100. 2-Hole Smooth-Face Clip, Narrow Strap Clip. Sold in quantities of 100. Priced per 100 units. 2-Hole Smooth-Face Clip, Extra Long Strap Clip (5 3/4"). Sold in quantities of 100. Priced per 100 units. Colored Vinyl Strap Clips, Yellow Vinyl Strap Clip with 2-Hole Nps Clip, 2-3/4" (70 mm). Quantity of 100. Colored Vinyl Strap Clips, White Vinyl Strap Clip with 2-Hole Nps Clip, 2-3/4" (70 mm). Quantity of 100. Colored Vinyl Strap Clips, Red Vinyl Fasteners. Sold in quantities of 100. Priced per 100 units. Colored Vinyl Strap Clips, Royal Blue Vinyl Strap Clip with 2-Hole Nps Clip, 2-3/4" (70 mm). Quantity of 100. Colored Vinyl Strap Clips, Green Vinyl Strap Clip with 2-Hole Nps Clip, 2-3/4" (70 mm). Quantity of 100. Colored Vinyl Strap Clips, Black Vinyl Strap Clip with 2-Hole Nps Clip, 2-3/4" (70 mm). Quantity of 100. 2-Hole Smooth-Face Clip, Deluxe Strap Clip. Sold in quantities of 100. Priced per 100 units. Clear Vinyl Strap Clips, "U" Bulldog Clip with Permanent Snap, Permasnap Strap Clip. Sold in quantities of 100. Priced per 100 units. Strap Clips, Neck Chain Adapter. Sold in quantities of 100. Priced per 100 units. Belt Strap, Vinyl Belt Strap. Sold in quantities of 100. Priced per 100 units. Reinforced Vinyl Strap Clips, Strap Clip with Suspender Clip. Sold in quantities of 100. Priced per 100 units. Strap Clips, Economy Strap Clip. Sold in quantities of 100. Priced per 100 units. Clear Vinyl Strap Clips, 3 Metal And Brass Part, Strap Clip, 2-3/4" Clear Vinyl Strap with 3 Metal + 1 Brass Part. Sold in quantities of 100. Priced per 100 units. Reinforced Vinyl Strap Clips, Strap Clip, Opaque White, 2-3/4" (70 mm), Filament-Reinforced Vinyl Strap, 2-Hole Clip, Nickel Plated Steel. Sold in quantities of 500. Priced per 500 units. Reinforced Vinyl Strap Clips, Reinforced Vinyl Strap Clip with Nps Suspender Clip, Opaque White, 2-3/4" (70 mm). Quantity of 100. Strap Clips, Strap Clip, Yellow, 3 1/8" (79 mm), Plastic Knurled Thumb-Grip with Delrin Strap. Sold in quantities of 100. Priced per 100 units. Strap Clips, Strap Clip, White, 3 1/8" (79 mm), Plastic Knurled Thumb-Grip with Delrin Strap. Sold in quantities of 100. Priced per 100 units. Strap Clips, Red Delrin Plastic Strap Clip with Knurled Thumb-Grip, 3 1/8" (80 mm). Quantity of 100. Strap Clips, Strap Clip, Orange, 3 1/8" (79 mm), Plastic Knurled Thumb-Grip with Delrin Strap. Sold in quantities of 100. Priced per 100 units. Strap Clips, Green Delrin Plastic Strap Clip with Knurled Thumb-Grip, 3 1/8" (80 mm). Quantity of 100. Strap Clips, Strap Clip, Black 3 1/8" (79 mm), Plastic Knurled Thumb-Grip with Delrin Strap. Sold in quantities of 100. Priced per 100 units.